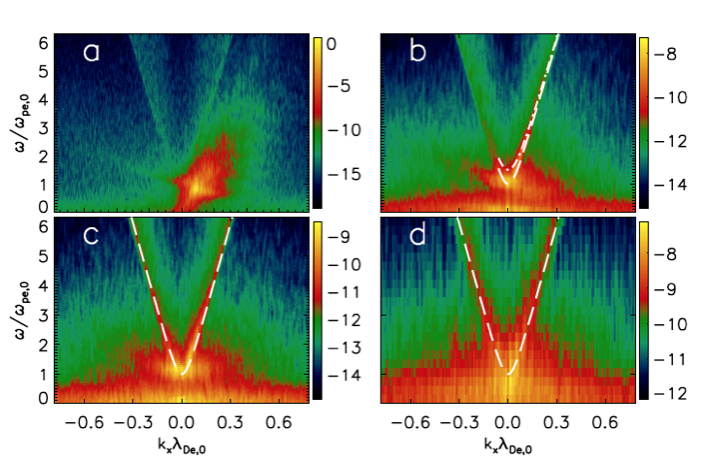 It is commonly accepted that energetic electron beams can produce drift frequency radio emission or Type III bursts since Ginzburg and Zhelezniakov first proposed the idea in 1958. However, the electron two-stream instability time (see reference 2) in the corona is fraction of a second, while the duration of coronal Type III bursts lasts several orders of magnitude longer. This problem is called the “Sturrock Dilemma” and remains a subject of active research for nearly 60 years. Solar radio bursts can be produced by the interaction of a Langmuir wave and a wave whose frequency is thousands of times lower than that of Langmuir wave. The mechanism is as follows: In homogeneous plasma, all the electrons oscillate around the equilibrium. However, if a low frequency wave is superposed to the Langmuir wave, the plasma becomes inhomogeneous and the electrons would experience an additional force. This force drives the electric charges to separate further on a large scale and cause the energy of the Langmuir waves to be transferred to electrons from low electric potential energy states to high electric potential energy states (See Fig. 1). This process is unstable and the electrons eventually have to jump back to a low energy state and release electron potential energy as photons with plasma oscillation frequency (see Fig. 2), which is in the radio band in solar corona. This process is comparable to lasers and we sometimes call it plasma laser. Fig. 1: The left panel shows the Langmuir wave profile at different times. The right panel shows the ion density caviton (top) and electron temperature (bottom) corresponding to the Langmuir wavepacket (red color) in the left panel. Similar to lasers, the time-scale for electron jump is very short, about several orders of magnitude shorter than the solar radio burst—a problem that is unsolved for decades. To keep the radio emission continuous, Langmuir wave has to be regenerated so that the electrons can be pumped from low to high energies. Using supercomputer simulations, Che, Goldstein, Diamond and Sagdeev recently discovered that the Langmuir waves could indeed be regenerated as the electrons jump from high-energy state to low-energy state. A high frequency acoustic wave is produced by the pulsation during the electron jumps. The oscillating electrons can absorb this wave and regenerate Langmuir waves. This process closes a feedback loop that maintains the continuous plasma coherent emission (see reference 1). Fig. 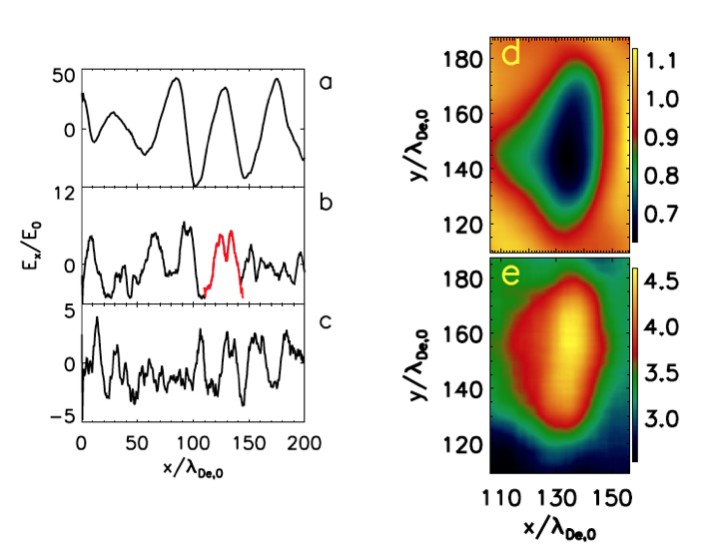 2: The plasma coherent emission at different stages of the nonlinear evolution of electron two-stream instability. No emission is produced at the linear growth stage of electron two-stream instability whose duration is about the electron plasma oscillation period (panel a). Panel b, c & d last about 5 orders of magnitudes longer of the period of electron plasma oscillation. The new mechanism can increase the duration of plasma coherent emission up to 5 orders of magnitude longer than previous models.